The License Manager (LicenseMgr) CSP administers the software licenses on a device, allowing an administrator or app running on the device to control the usability of software features that require licensing. Software components can be made usable, unusable or feature-limited based on the license. If a component requires licensing, the absence of a valid license will limit or prevent its functionality. Software components that to not require licensing are not effected by this CSP. Some Zebra devices include a built-in app called License Manager, which allows device users and/or administrators to perform license-related tasks manually on the device. 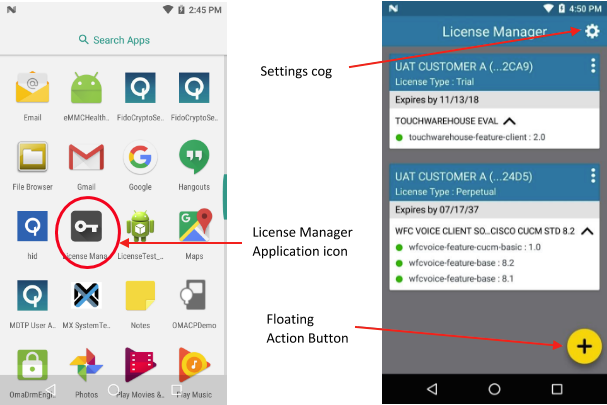 The License Manager icon (left), and the app's home screen showing multiple activated licenses. Software licenses are acquired from a Zebra Software License Server. They are issued as Software License Files and are associated with specific software components through the use of Licensed Feature Names. A Software License File can be used only to enable use of its associated Licensed Feature Name. A component can have multiple capabilities, each controlled through separate Licensed Feature Names. Alternatively, a component can have all of its capabilities controlled through a single Licensed Feature Name. Software License Files are acquired from the Zebra Software License Server, stored locally or online, and referenced through the LicenseMgr. However, the server does not verify whether such files are matched to a particular Licensed Feature. If a valid Software License File is wrongly applied to Licensed Feature other than the intended feature, that feature is enabled and no error results. To prevent this, Zebra recommends using the Verification Method parameter (below) to verify that Licensed Feature Name(s) match those contained in the Software License File(s). This causes an error to be returned in the Result XML in the event of a mismatch. Used to specify the method of performing license actions on the device. "Legacy" Symbol actions are performed on license files stored on the device. Zebra actions pertain to a server-based license store. 0 do_nothing This value (or the ansence of this parm from the XML) causes no change to device settings; any previous setting is retained. 1 symbol Performs a (legacy) Symbol License Action. 2 zebra Performs a Zebra License Action. Used to specify the action to perform on an Activation ID (AID) on the device. For Zebra-branded devices only. For Symbol-branded devices, use the License Action parameter. To use Option 6, specify the 39-character Activation ID using the Activation ID Refresh parameter. Note: Options 4 and 5 are used programmatically on the device and are not intended for human interaction. Shown if: The License Source is "Zebra Cloud" and License Action Zebra is "Activate AID" and License Choice is "Perform Zebra license action" and License Choice is "Use a local license server option"
1 activate Activates an AID on a Zebra device. 2 return RESERVED FOR FUTURE USE. Deactivates an AID on a Zebra device, returning it to general use. 3 reset RESERVED FOR FUTURE USE. Deactivates all AIDs on a Zebra device and returns them to general use. 4 acquirefeature Used programmatically on the device; no human interaction. 5 returnallfeatures RESERVED FOR FUTURE USE. Used programmatically on the device; no human interaction. 6 refreshAID Causes the device to contact the licensing server to renew a device license following a license renewal purchase. 7 deleteLicenseSource Removes the specified license source from the device. Controls whether to use a cloud-based or local Zebra Licensing Server, or preactivated file on the device. When Zebra Cloud is selected (option 1), specify the server location using the License Cloud URL parameter. Shown if: The License Action Zebra is "Activate" and License Choice is "Zebra"
1 Zebra Cloud Indicates that one of the Zebra Licensing cloud options is used. 2 LLS Indicates that a local licensing server is used. 3 Preactivated Indicates that preactivated license file is present on the device. Used to specify the source for Zebra cloud-based licensing on the device. Shown if: The License Source is "Zebra Cloud" and License Action Zebra is "Activate " and License Choice is "Zebra"
1 Zebra UAT Cloud Selects cloud-based Zebra licensing test server. 2 Zebra Production Cloud Selects the cloud-based Zebra licensing production server. 3 Zebra Production Cloud Via Proxy Used when the Zebra production cloud-based licensing server is accessed through a proxy or relay server. 4 Zebra Test Cloud Via Proxy Used when the Zebra test cloud-based licensing server is accessed through a proxy or relay server. 5 Zebra Custom Cloud Allows a custom URL for an on-premise license server or relay server to be specified. Used to specify the URL (and optional port number) of an on-premise server containing Zebra License Activation ID(s) or a relay server pointing to an external licensing server. This parameter is required only for devices that do not have access to networks outside the walls of an organization in which they are to be administered. Shown if: The License Source is "Specify a custom URL for Cloud Licensing Service" and License Choice is "Zebra"
Used to specify a "friendly" name for the local licensing server as an aid to easy identification. Shown if: The License Action Zebra is "Activate" and License Choice is "Zebra" and License Source is "LLS" OR License Source is "Zebra Cloud" and License Choice URL is "Zebra Production Cloud Via Proxy, Zebra Test Cloud Via Proxy or Zebra Custom Cloud"
Used to manually specify the 39-character code provided by the Zebra licensing system for activating a license on the device. Shown if: The License Action Zebra is "Activate" and License Choice is "Zebra" and License Source is "Zebra Cloud or LLS"
Used to specify the number of license copies to be activated on the device. Used to specify the source of the preactivated license file on the device. Shown if: The License Action Zebra is "Activate" and License Choice is "Zebra" and License Source is "Preactivated"
1 Zebra UAT Indicates use of a preactivated license from the Zebra test cloud. 2 Zebra Production Indicates use of a preactivated license from the Zebra production cloud. Used to specify the delivery method of the preactivated license file on the device. When "reference" is selected (option 2), use the "Preactivated License Path And File Name" parameter to specify the path and file name of the licence file on the device. 1 embed Embeds the preactivated license file into the profile XML. 2 reference References a preactivated license file already on the device. Used to specify the licensing file to be embedded in the XML. Shown if: The License Action Zebra is "Activate" and License Choice is "Zebra" and License Source is "Preactivated" and Preactivated License Method is "Reference"
Used to specify the path and file name of the preactivated license file on the device. Shown if: The License Action Zebra is "Activate" and License Choice is "Zebra" and License Source is "Preactivated" and Preactivated License Method is "Embed"
Used to select the method by which to return a Zebra license. Shown if: The License Action Zebra is "Return" and License Choice is "Zebra"
1 Zebra Production Cloud Returns the license to the Zebra Licensing cloud. 2 Zebra UAT Cloud Returns the license to the Zebra test cloud. 3 Server Friendly Name Returns the license using the server's friendly name. Used to manually specify the 39-character code provided by the Zebra licensing system for reclaiming a license from the device. Reclaimed licenses are returned to the organization for assignment elsewhere. Used to specify the number of license copies to be reclaimed from the device. Used to specify a license code to refresh on a device. This parameter works in conjunction with the RefreshID Zebra License Action, which causes the device to contact the licensing server to renew a device license following a license renewal purchase. Shown if: License Action Zebra is "Refresh AID" and License Choice is "Zebra"
This parameter is not intended for user interaction. Used to programmatically specify the name of the feature to be enabled. Shown if: License Action Zebra is "Acquire Feature" and License Choice is "Perform Zebra license action"
Used to programmatically specify the version number of the feature to be acquired using the Feature To Acquire parameter. Used by licensed apps on the device to obtain the number of times a feature can be used. This feature is used programmatically, and is not intended for human interaction. Shown if: License Action Zebra is "Acquire Feature" and License Choice is "Zebra"
Used to apply or remove a Software License on a legacy Symbol device. For Zebra-branded devices, use the License Action Zebra parameter. Applying a Software License on a device makes the specific capabilities of that Software Component usable on that device. Removing a license makes the controlled capability unusable or limits its features. Note: The license removal action deletes the licence only from the private license store; the license file still exists on the device and must be deleted separately. Shown if: License Choice is set to "Symbol"
1 apply Applies a Software License on a Symbol device. 2 remove Revokes a Software License from a Symbol device. Controls whether to verify that the Licensed Feature Name specified in the Standard or Custom Feature Name parameters matches the contents of the Software License File. Zebra recommends using this parameter to help prevent license-feature mismatch. Software License Files are acquired from the Zebra Software License Server, stored locally or online and referenced through the LicenseMgr. The sever does not verify whether such files are matched to a particular Licensed Feature. If a valid Software License File is wrongly applied to Licensed Feature other than the intended one, the feature will not be enabled and no error will result. The Verification Method parameter prevents this scenario by verifying that Licensed Feature Name(s) match those contained in the Software License File(s) and otherwise generates an error in the Result XML. Shown if: The License Action is "Symbol" and License Choice is "Symbol"
0 Do not verify feature name This value (or the absence of this parm from the XML) causes no change to the verification method; any previously selected setting is retained. 1 Verify against a standard feature name Verifies that the Licensed Feature Name contained within the specified Software License File matches a specified Standard Licensed Feature Name. 2 Verify against a custom feature name Verifies that the Licensed Feature Name contained within the specified Software License File matches a specified Custom Licensed Feature Name. 1 SIMULDC1_0_0 Verifies that the SimulScan OCR/OMR Licensed Feature Name contained in the Software License File matches the Standard Licensed Feature Name of the SimulScan software component. Shown if: The Verify Method is "Verify against a custom feature name" and License Choice is "Symbol"
The Embed value (option 1) indicates that the contents of the Software License File is embedded into the Request XML. To use this option, the Base64-encoded contents of the Software License File acquired from the Zebra Software License Server must be Base64-encoded a second time by the MDM Agent before being embedded this Request XML document. Note: Although it increases the data size, this option offers the advantage of a self-contained Request XML. The Reference value indicates that a Software License File, which must be present in the device file system, is referenced by its path and file name. Note: This option requires that the Software License File be transferred to the device file system before the Request XML is submitted, and requires specification of the exact path and file name of the Software License File in the device. If the license should be applied after an Enterprise Reset, the license file must be stored in a persistent location such as the /enterprise directory. Note: Regardless of the method used to supply the Software License File (Embed or Reference), the supplied Software License File must contain valid contents acquired from the Zebra Software License Server. An attempt to apply a Software License File that contains invalid contents will result in an error in the Result XML. In addition, if the Software License File was an Individual Device License, the device serial number embedded in the Software License File must match the serial number of the device onto which it is being applied. Any attempt to apply a mismatched license will generate an error in the Result XML. 1 embed Embed the license blob from the license file into the XML. 2 reference Reference a license file already on the device. Used to specify the Software License File, the contents of which are embeded in the XML. The contents are Base64-encoded, which increases content size by about 33 percent. The Software License encoded within the Request XML is extracted and applied to the device. Shown if: The License Action is "Apply" and License Method is "Embed" and License Choice is "Symbol"
Used to specify the path and file name of a Software License File, which must exist in the device file system and contain the exact contents acquired from the Zebra Software License Server. This parameter applies the Software License specified in the Software License File to the device. Shown if: The License Action is "Apply" and License Method is "Reference" and License Choice is "Symbol"
Controls the method of selecting the Licensed Feature Name, which identifies the Software License to be removed from the device. Shown if: The License Action is "Remove" and License Choice is "Symbol"
1 standard Indicates that a Standard Licensed Feature Name will identify the Software License to be removed from the device. 2 custom Indicates that a Custom Licensed Feature Name will identify the Software License to be removed from the device. Shown if: The Select Method is "Standard" and the License Choice "Symbol"
SIMULDC1_0_0 SimulScan OCR/OMR Causes the Software License for the SimulScan Software Component to be removed from the device. Used to specify a custom Licensed Feature Name to identify the Software License to be removed from the device. To ensure proper removal, specify the exact Licensed Feature Name contained in the original Software License File applied to the device, including letter case, whitespace, etc. Shown if: The Select Method is "Custom" and the License Choice "Symbol"